Nepal is suffering the effects of two major earthquakes in quick succession with multiple large aftershocks. We feel for the Nepalese…the Christchurch earthquakes of 2011 are still with us here in New Zealand as a poignant reminder of how devastating these can be. Our friend, Jeff Keily, from Sunshine Coast, Queensland, has recently taken many building trips to Nepal. Being a genuine and caring sort he has made many friends there as he has rebuilt and renovated orphanages alongside the locals. His son, Joel Keily, has started a gofund.me account #nepalquakerelief for donations and has t-shirts you can purchase to help with fundraising. Jeff will be taking the funds directly to the orphanages on his next trip in July. If you’d like to help him you can find the page at www.gofundme.com/tp5x2w. Every New Zealander has a piece of their heart in Nepal. That’s where our national icon, Sir Edmund Hillary, succeeded at being the first to conquer Mt. Everest in 1953. He fell in love with the Sherpa people of Nepal and returned to help build schools and hospitals. He took every Kiwi with him. 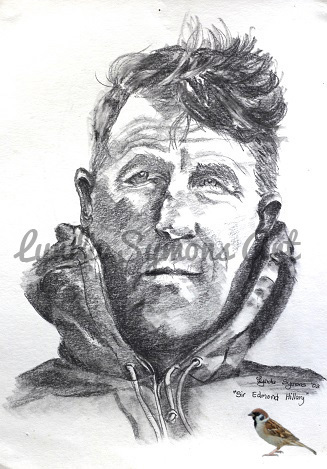 All this news of Nepal reminded me of a drawing I did a few years ago of Sir Ed. It is now gracing the wall of another who loves to climb mountains and do things I just shake my head in wonder at. Nepal has been one of his favourite places, too, and I hear them often talk of going back… their way of giving. Although I cannot present you with an original, there are prints available on the gallery page for $20 (postage is free within NZ). And remember to give as you can whether funds, taking a trip yourself, or in prayer. Sir Edmund left us a great example of a generous heart.